Remember how the other day I speculated that another celebrity was about to meet his or her maker because Billy Mays (Oxyclean guy) and Fred Travalena (impersonator) had just passed away? Famous people always die in threes, you know. I gave it 2 weeks. Well, it only took 2 days. Karl Malden just checked out and left for the Great Beyond. Granted he had faded from the collective consciousness a bit; Internet Movie Database gives his last appearance as a one shot role on The West Wing in 2000. 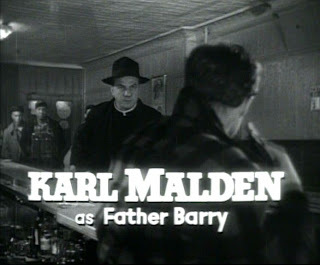 But at one time Mr. Malden was one of those versatile, stalwart actors that is always playing in something and everybody recognizes. Johnny Carson did imitations of him, for crying out loud! I knew him best from Patton, where he played one of my favorite WWII generals, Omar Bradley. And we always used to watch The Streets of San Francisco back in the '70's, in which he starred along with a young whipper-snapper named Michael Douglas. But the role he'll probably be remembered for long after all his films and TV shows are forgotten is as the guy on those American Express commercials barking, "Don't leave home without it!" So long Mr. Malden. I hope you didn't forget your card.